Today is National Lasagna Day! Although we love to celebrate lasagna every day of the year (um, by eating it!) this is a good time to whip up some healthier versions of one of our favorite Italian dishes. Today is National Lasagna Day! Although we love to celebrate lasagna every day of the year (um, by eating it!) this is a good time to whip up a healthier version of one of our favorite Italian meals. 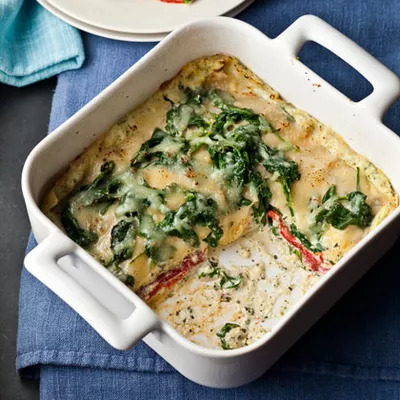 The traditional dish can deliver quite a bit of saturated fat via the cheese and meat (if there is any), and added sugar, depending on the type of sauce used. In these three recipes we tried to cut the fat and calories while amping up the veggies and fiber. Make one of these delicious recipes tonight. Many lasagna dishes are short on fiber, but not this bean-packed dish. It's vegetarian and low in both saturated fat and calories. Ingredients: lasagna noodles, shredded reduced-fat Monterey Jack cheese, part-skim ricotta cheese, green chiles, chili powder, salt, black beans, cooking spray, salsa, cilantro sprigs. This veggie lasagna is full of delicious and fresh ingredients as well as nutrients like vitamins A, C and K, in addition to potassium. 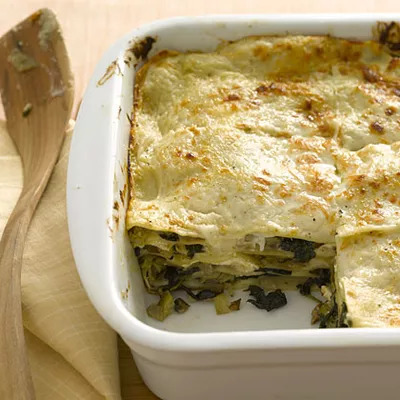 Ingredients: cooking spray, porcini mushrooms, fresh lasagna noodles, skim milk, light butter spread, all-purpose flour, salt, freshly grated nutmeg, zucchini, black pepper, artichoke hearts, spinach, low-fat ricotta cheese, freshly grated Parmesan cheese. 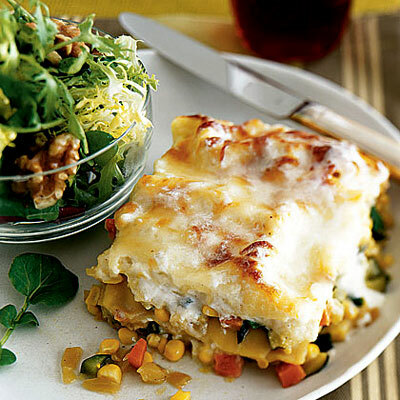 With only 260 calories per serving, this lasagna dish is guilt-free. The secret is using low-fat cheese, egg whites, and fewer ingredients than many other lasagnas. Ingredients: part-skim ricotta cheese, pesto, egg white, baby spinach, wonton wrappers, roasted red peppers, part-skim mozzarella cheese, Parmesan cheese.